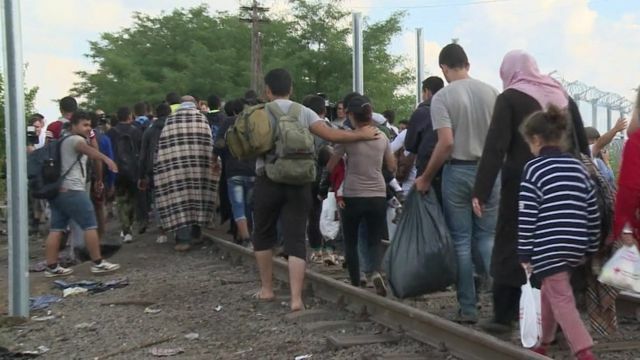 Hungary prepares to seal off border Jump to media player Hungarian Prime Minister Viktor Orban has called on the European Union to give Syria's neighbours more financial aid to help those displaced by the civil war. Hungary's crackdown on illegal migrants Jump to media player Hungarian Prime Minister Viktor Orban promises tougher action on migrants, saying that people who illegally cross in to his country will be arrested. In Hungary's 'filthy' detention centre Jump to media player The United Nations refugee agency says it is sending pre-fabricated housing units for 300 families to Hungary. Video shows inside Hungary migrant holding camp Jump to media player Video footage shows chaotic scenes inside the overcrowded camp and migrants are seen pushing and shoving as they try to catch food packs being tossed into the crowd by police. Hungary prepares to secure border Jump to media player The Hungarian government is preparing to strengthen security on its border with Serbia. Camerawoman trips up fleeing migrants Jump to media player A Hungarian camerawoman was sacked after being accused of tripping up fleeing migrants. Hungarian Prime Minister Viktor Orban has called on the European Union to give Syria's neighbours more financial aid to help those displaced by the civil war. Mr Orban said supporting the Middle Eastern nations with such a package would end the mass migration to Europe. Thousands of people continue to cross the Hungarian-Serbian border, ahead of plans to seal it off next week and arrest anyone who attempts to cross illegally. Anna Holligan reports from the border.